Every bed needs their partner in crime - the bedside table. With our Curve 3 Drawer Bedside Table you can maximise storage and add a stylish modern addition to your bedroom. The neutral colours of the solid white oak and oak veneers add a timeless, contemporary look fitting to any bedroom. Handy, discrete storage allows effortless organisation and decluttering through clever craftsmanship or the Curve 3 Drawer Bedside Table. A stunning solid white oak material accompanied by oak veneers provides a beautiful transition of contemporary fashion and natural materials. The high quality construction is furthered by stylish finishes such as waxed oak coating and recessed handles. The modern design of the Curve 3 Drawer Bedside Table shows in the clean edges and curved corners, adding a sense of simplicity and style to any bedroom. 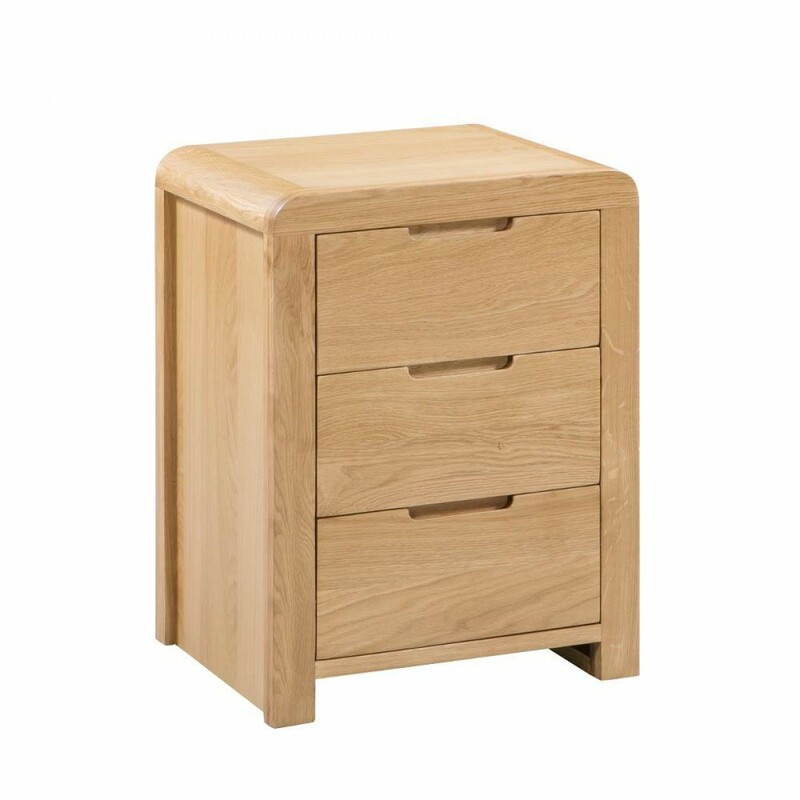 The Curve 3 Drawer Bedside Table offers three equally conveniently placed storage drawers all at an arm's reach. The sturdy drawers built from strong oak are complemented by dovetail joints to ensure durability and characterful flair. The top of the Curve 3 Drawer Bedside Table can also be exploited to expand storage use and minimise clutter as well as providing opportunity for displayable items to add character to the bedroom. The Curve 3 Drawer Bedside Table is part of the Curve bedroom furniture collection available online, extendable to fill an entire bedroom with quality and character. Every Curve 3 Drawer Bedside Table is delivered fully assembled to be welcomed into your home right away.